Creamed Eggs on Toast is a dish that I enjoyed ever so much as a child. As an adult I haven’t made this as often, I wished that I had not let this classic dish fall out of my recipe library. Creamed eggs on toast was a dish that was introduced to me by a neighbor. It was Lent and we couldn’t have meat on Fridays when I was growing up. We also had this dish when you wanted a heartier dish for breakfast. If you have never had creamed eggs on toast, hard-boiled eggs are chopped and placed into a white sauce, or even a bechamel sauce, and then this is spooned over toast. For me, this is comfort food. It is a great way to use up leftover Easter eggs, or even when you don’t have a lot in the kitchen, this is one of those dishes you should be able to put together. There are many variations on this dish, and honestly, I think they are good. 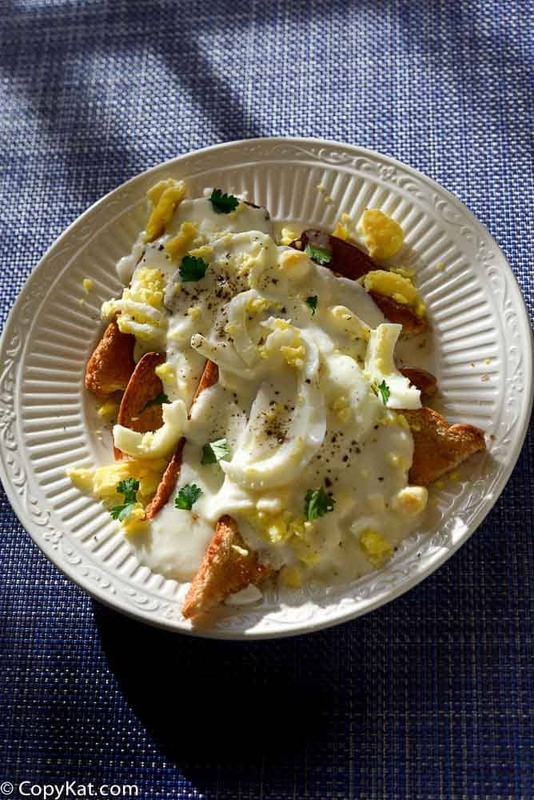 You might have heard this dish is referred to as Eggs A La Goldenrod. Here the cooked egg whites are chopped up and added into the sauce, and then the egg yolks are chopped and sprinkled on top. You can season the sauce with cayenne pepper, paprika, Worcestershire sauce, sherry, chopped onions, or anything else you may like. If you like you could add leftover ham, bacon, or turkey to this dish. You may even want to add a touch of cheese to the sauce. I think you will find you can change this sauce into just about anything you like. I personally like this dish as it reminds me of growing up, and having this for the first time at my neighbor’s across the street. This was a dish that I also quickly learned how to make. If you enjoyed this recipe be sure to check out my many other Learn to Cook Recipes. This recipe is from my learn to cook series where I am making every recipe from my old home economics cookbook. Looking for more great egg recipes? Be sure to check out these recipes. 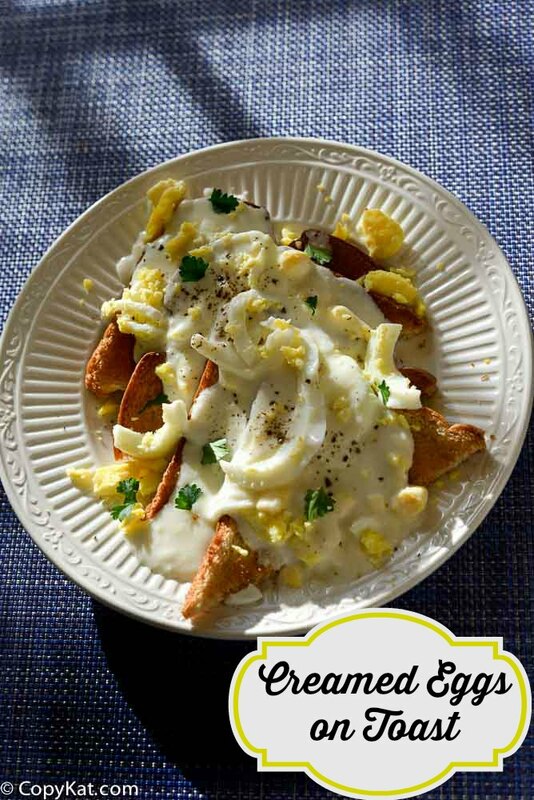 Creamed eggs on toast is a meat-free recipe that combined hard-cooked eggs and a rich cream sauce. In a small pot over medium heat add butter and stir until melted. Sprinkle flour and salt in pan and whisk together with the butter. Cook flour and butter for about 1 minute or until the flour and butter become fragrant. Add about 1/2 of the milk and stir until the mixture becomes thick. Add the remaining milk and stir until the mixture becomes thick. Add chopped egg, reserving some of the chopped egg for garnish. Pour sauce over toast and garnish with remaining chopped egg. this has been a favorite of mine for ages. I thought I invented it. I have not made this in years. Oh, so good. I have a couple of hardboiled eggs in my fridge and immediately remembered having creamed eggs on toast as a child so googled it to refresh my memory and find a similar recipe and your site popped up! This is exactly what I was looking for! I’m going to prepare this just as soon as I post this comment…can hardly wait! I had these growing up as a child too! I loved this dish. This is so simple, but I bet it tastes amazing! I am a huge fan of eggs prepared in any way, shape, or form! Bacon or sausage drippings would make a good substitute here as well. I think most everything goes best with bacon! Love this!! My dad taught me how to make this when I was a kid, he learned it in the Navy. It’s also my go to comfort breakfast. My grandfather learned how to make sausage gravy when he was in the army. He hated that dish. I make this on occasion. Making it tonight. Just to use up some ham steak I had left from the other day. I figured a egg dish would go good with the leftover ham. Whoever wrote the recipe said White Sauce or Bechemel. They are both the same thing. Bechemel is the proper French terminology of white sauce. I bet this is a good way to make this with ham steak. So my understanding of Bechemel is that it is made with seasoned milk. You basically take milk and soak an onion, perhaps a clove, or something before you make the sauce. I was highly corrected on this when I made a white sauce and called it Bechemel on youtube. I bet you could use this now with the cold winter you have.